September 25, 2015 will be a treat for lovers of fuzzed out psychedelic rock worldwide as WE HUNT BUFFALO unleash their new album Living Ghosts. Recording with Jesse Gander (BISON, JAPANDROIDS, ANCIIENTS) the Vancouver based trio have captured a sound that is epic on all levels and created with vinyl front of mind. NZR: The production on Living Ghosts is your best yet. It’s warm, I feel like I’m listening to a vinyl when it’s actually an mp3, and those drums, damn! 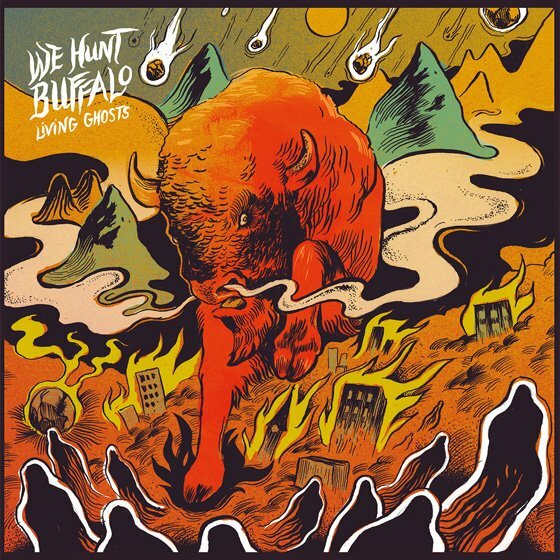 How successful do you think Jesse Gander was in translating the WE HUNT BUFFALO sound into what we hear on the final recording? RF: Yes, Jesse is well known around here for his drum sounds! I think he did a great job of capturing what we were looking for on the final recording. We very much had vinyl in mind through the planning and recording, so I’m glad you’re picking up on that vibe. NZR: So how does a Canadian band end up on a Swedish label like Fuzzorama? They have a great roster of bands! Did you find them or did they find you? RF: We have been TRUCKFIGHTERS fans for years, so that naturally lead to us knowing about Fuzzorama. They were top of our list for labels while we were pitching the new record, and also came back at us excited about the album. They do have a great roster of bands, and we’re stoked to be part of it! NZR: What are your favourite parts of Living Ghosts and why? RF: I like the record as a whole… a front to back listen. It’s pretty dynamic and gives you a good profile of what we’re about as a band. There’s some heavy tunes on there, then some chiller, more moody tunes. Personally I like variety in a record… it’s less likely to cause ear fatigue when listened at full volume. NZR: In what ways do you feel Living Ghosts has an edge over your previous works like Blood from a Stone for example? RF: This record is basically a culmination of our first LP and the Blood From a Stone EP. The BFAS EP was heavy, but lacked the depth this record has (probably because it only had 4 tracks). Also, we were able to record that EP on free studio time here in Vancouver, so we kinda had to make do with what we were offered. We actually did the guitar and vocal overdubs at our home studio too. So when it came time to record Living Ghosts, we were able to book a good solid week in the studio (Rain City Recorders) and not feel rushed. NZR: Maarten Donders from the Netherlands did the artwork for this album and it looks great. Having the vinyl to see it full size will be a must for me! Did you go to Maarten with a concept and the music or did you just let him run wild? RF: We just got the vinyl copies in the mail from Sweden… they look awesome. Very happy with how Maarten’s work turned out. We basically gave him the idea of the buffalo as a symbol of the apocalypse, and he took it from there. NZR: The tracklist really lends itself to a vinyl release too. The songs in the first half hit you hard up front while the remaining ones build up before they do. Did the song-writing just work out that way naturally? RF: That was very much intentional. We wanted this record to be made for vinyl and have that full record flow to it. So yes, the front half is meant to kick you in the face, while side B is more brooding and dynamic. That’s what great about vinyl too… you can almost have two mini records in one, and depending on what mood you’re in, play that side. NZR: I love the intro Ragnarök and how it leads into Back to the River. What’s the meaning behind the lyrics of that song? RF: Back to the River is basically a call to action. We have destroyed enough of this earth and it’s time to wake-up. So here’s a few of the lyrics: ‘I’m in view of a monster, raging out of control (meaning, us humans)” and “These are evil times, we’re the ones who know much better. Stop and re-align”. NZR: Do you have any music videos for the album coming up? RF: Yes, we have a video ready to go for Hold On currently. We will also do more, provided we can find the funding. NZR: WE HUNT BUFFALO packs some punch for a three-piece, what gear are you working with to get those guitar tones and what tuning do you use? RF: I play a Les Paul through a Marshall Silver Jubilee and Vox AC30. Brendan has an Ampeg SVT and Rickenbacker. Both of us use Big Muff Fuzz pedals. We tune down a full step, then drop to C on some tracks (Back to the River, Prairie Oyster). For the live show, I’ve started using an ABY switch and looper. This lets me play a rhythm part through one amp, then switch over and play lead through the other. It kinda makes it sound like a 4 piece… but definitely big for a 3 piece. NZR: In 2010 you made a conscious decision to play heavier music which I thought was interesting since bands often go the other way with time. What made you take that step? RF: We were playing with the same line-up at the time, but the music just didn’t have that punch to it. We all like the heavier side of things, so we decided to mix it up. Changed the band name and sound. NZR: You’ve shared the stage with quite an array of bands from STEEL PANTHER to LIVING COLOUR. What was it like hanging out with those guys? RF: Haha, STEEL PANTHER were funny guys. Played a New Years show with them in Vancouver a few years back, kinda a random gig. LIVING COLOUR are great guys and amazing musicians. NZR: Back in June a fan asked if you could play a Calgary gig and you just went out and organised one. How cool is that! How’d it go and did he thank you at the show? RF: Yeah, we were already out on the road doing a western Canadian rip with CANCER BATS when some Calgary fans piped up about us not having a Calgary show. So we made some calls and were able to set one up at Nite Owl. The show was decent considering we only had a couple days to promote it. I don’t know if that one fan thanked us though! NZR: Once the album is out what plans do you have for touring. I see people have been asking you to play all over the place. Think you might do a New Zealand / Australia tour sometime? RF: We will be touring Canada in October and will focus on getting to Europe after that. We would love to come to New Zealand and Australia… just have to make sure the timing is right and that there’s enough people to support the shows! NZR: Thanks for doing the interview and all the best with everything! RF: No problem, thanks for the good questions! Hear ‘Back to the River’ below and order ‘Living Ghosts’ from the Fuzzorama Store. Keep up to date with WE HUNT BUFFALO on Facebook.